Analysts are still weighing in on what 2019 will bring for investors and traders. In these uncertain times, you could probably hear the fears that the post-great recession bull market will come to an end, and another economic downturn is just around the corner. Despite these arguably over-pessimistic views, there are still some promising growth stocks to be found. The three famous investment banks have already shared their views on the stock markets in 2019. JP Morgan Chase & Co., Wells Fargo and Bank of America offer different takes on the uncertain stock market outlook for 2019, though sharing a number of similarities. JP Morgan mentions that one of the most significant issues moving global markets in 2018 was rising trade tensions, and this tendency will likely continue in 2019. The escalating trade war may slowdown both the US and the international economies that will negatively affect global stocks. Tightening labour markets and higher mortgage rates may also contribute to a potential recession. The outlook suggests “2019 will be marked by ever-changing conditions as the economic recovery of the past decade decelerates”. The BofA has shared a rather enthusiastic and confident view of stock market in the year ahead. Having acknowledged a possible slowdown in earnings growth, the bank predicts sound and fairly positive stock market performance. The ambitious forecast suggests stock market will go up more than 15%. Recent performance of a famous athletic apparel producer, Lululemon athletica, is very impressive. LULU shares surged to new highs after the company’s latest performance reports that demonstrate continuous growth in sales. Despite a tough competition on the athletic wear market, from industry giants such as Under Armour, Nike, Adidas to smaller entrants, Lululemon keeps showing robust growth rates. No wonder that analysts rank LULU as a “strong buy” and believe in the company’s success in 2019. Twilio cloud communication platform experienced a killer year in 2018. One of the biggest gainers of the year, TWLO stock more than tripled, hitting its all-time highs. The success is backed by the company’s improved profitability, multiple expansion and accelerating revenue growth. Even after this outstanding rally, Twilio stock keeps on track in 2019. 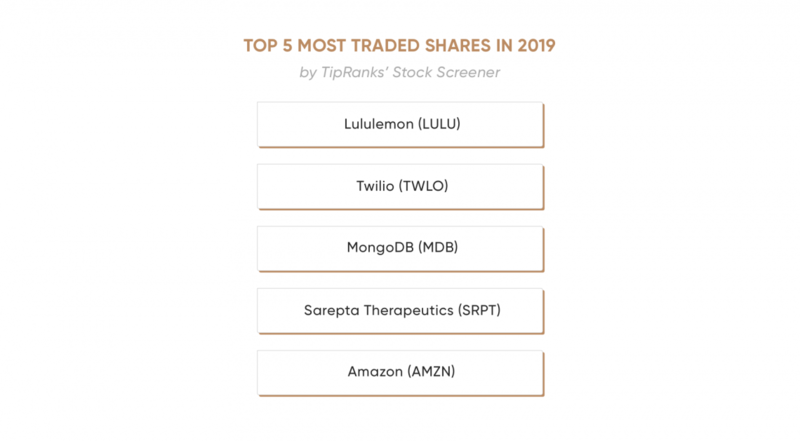 One of the most popular databases for modern apps, Mongo is one of the top investors’ picks for 2019. The experts remain bullish on the MDB prospects for sustaining high growth. In December 2018, the company reported better-than-expected third-quarter results. The revenue rose 57% up to $65 million. Mongo’s cloud-based database-as-a-service solution – Atlas – contributes greatly to the company’s growth, accounting for 22% of total revenue. Healthcare stock Sarepta Therapeutics also got into our list of top 5 stock market gainers of 2019. The company specialises in biopharmaceutical solutions and genetic medicines to treat rare neuromuscular diseases. Sarepta stock experienced a 96% growth in 2018 and is considered as a ‘strong buy’ for 2019. In 2018, the world famous e-commerce company proved its position as a leading online retailer. In the second quarter of 2018, the company reported a record-setting $2.5 billion in profit, which is 1,200% more than $197 million at the same quarter of 2017. These results are supported by the outstanding performance of the Amazon’s cloud computing business, Amazon Web Services (AWS). 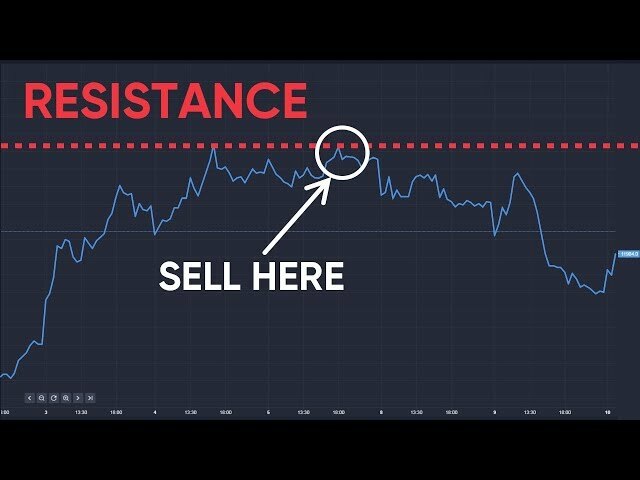 Today, the analysts share the view that Amazon can be one of the best picks for 2019. Even though AMZN has already built one of the world’s largest ecommerce businesses, its potential for growth is still enormous. No matter what 2019 will bring us, one thing will remain unchanged: the stock market will always have its risers and fallers. The challenge is to be in the right place in the right time to find out who they are and to seize the moment.